I haven’t read any Kadare yet, but I plan to. Do you have a favorite? I read this novel in Portuguese a few years ago, I liked it, but it didn’t blow me away. Also although I’m seldom one to nitpick about translations, I remember that was one of the few cases where I felt the translation was so-so, lots of clumsy syntax in it. I hope the English translation did better. This sounds to be interesting yet tragic. This was such a terrible era for Eastern Europe. You mentioned that at one point the book shocked you. Reading about such times can be disturbing. I find that such books bother me more and more as I get older. I like the pyramid allegory. An author I really want to try. It’s a problem that most of his books are indirect translations but then again, I don’t want to miss out on a great writer just because I don’t speak Albanian. Good to know this has been translated directly. No I haven’t read this author, but his name has been crossing in front of my eyes lately so I bought a couple of his titles. Not this one though. I enjoyed this far more than his previous novel, The Accident. I think you’re right about it being personal – the ending of his autobiographical Chronicle in Stone is very similar to the beginning of this. It’s a shame I haven’t read Kadare before but his books are in my radar for a long time. I am glad you reviewed this. His latest book perhaps is the right place to start. Thanks for the review Stu, you read such important books. Kadare is someone I, like many above, have been meaning to read for years. Thanks for the reminder, Stu. Judging from what’s been said above, I may try Chronicle in Stone and then move on to this if I like that. 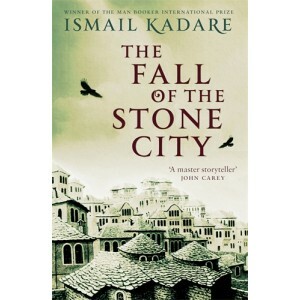 I liked this book and Kadare is one of my favorite authors. I have lived a few years in Tirana and he was a frequent sight on the street and the coffeeshops in the center. (He is dividing his time between Paris and Tirana). Three of his books blew me away: The General of the Dead Army, Broken April and The Palace of Dreams, and also the others are simply very good. The Kadare character in the novel might well be someone from his family, the surname Kadare is very common in Gjirokaster.